Nintendo has asked gamers to help rescue a princess, race go-karts and even play tennis with a motion-sensing controller. Now, the maker of Mario is asking fans to do something new: share their weekend plans with friends. 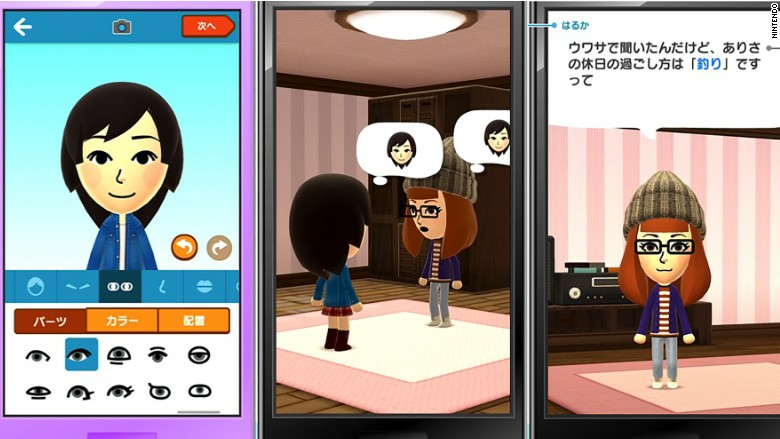 Nintendo's first smartphone app -- Miitomo -- launched Thursday in Japan, and will soon debut in other markets. It's distinctly social, and at first glance, may seem like a bizarre turn for a company known for games. The app asks questions of users, such as their favorite TV show, or what they hope to be doing in 10 years. They're the sort of general queries that Nintendo says rarely come up in normal conversation. The answers are then shared with friends in messages delivered by Miis -- the cartoonish avatars featured in Wii Sports, one of Nintendo's biggest hits of the last decade. Some argue the app is true to Nintendo's 120-year history. "Nintendo came into this business as a toy company, and the reason they make video games is because they view those as essentially being the best toys they can build," said games industry analyst Rob Fahey. "Miitomo fits the definition of a toy rather than a game quite well." Miitomo is the first of five apps Nintendo plans to release on smartphones and tablets over the next year, as it tries to diversify and rely less on dedicated game consoles. The apps can't come soon enough: Sales of the popular 3DS handheld are slowing, while the Wii U never even came close to the remarkable success of the Wii. Little is known about Nintendo's next console, code-named "NX." "We absolutely see smart device apps as a key pillar for the company moving forward." said Nintendo of America president Reggie Fils-Aime. He outlined four main areas of operation for Nintendo: Dedicated game consoles, smartphone apps, licensed merchandise and partnerships like a tie-up with Universal Studios to put Nintendo characters in theme parks. Tying them together is a new rewards program, My Nintendo, that will span Nintendo's smartphone apps and dedicated console games. Users will earn My Nintendo points, which can then be spent on exclusive rewards like a Mario costume for a Mii. Fils-Aime stressed that Nintendo's console and smartphone offerings will be distinct. "The experiences we build for dedicated gaming systems are different than the experiences we will build for our smart device applications," he said. That means adopting the free-to-play structure common on smartphones and tablets. Miitomo is free to download on iOS or Android, but includes optional in-app purchases. Players can buy outfits to dress up their Mii, for example. Many gamers have asked Nintendo (NTDOF) to bring classic games like Super Mario Bros to smartphones, but Fahey argued that the widespread free-to-play structure poses a major problem. "Nintendo has an extraordinary back catalog, probably more than any company in the industry, but none of it fits with the free-to-play paradigm that exists in mobile," says Fahey. "There will be a whole bunch of people who would scream and shout the house down if they started changing their back catalog to fit with the commercial realities of mobile." When asked whether Mario might eventually go mobile, Fils-Aime played coy. "Nintendo has said that none of our IPs are off the table as potential applications in an app. We will continue to provide a variety of different experiences, and we'll continue to leverage all of our world-famous IP, so stay tuned," he said.